MIRPUR: Four people, including a woman, were killed and three others injured grievously as a passenger wagon buried under a giant landslide in Nikayal town of Kotli district of Azad Jammu Kashmir on Thursday. Kotli Raj Senior Superintendent Irfan Salim told the media that the ill-fated wagon was on way from Sailone village to Nikayal when it met the mishap by having been badly hit by a big landslide at Bag Naara, about 50 kilometres from district headquarters of Kotli while passing through the area of huge hilly terrain. Those lost their lives were identified as Wajid, Karamat Hussain, Abdul Qadeer and Nazia Kouser and the injured, identified as Touqeer Ahmed, Safeena Kouser and Hawaldar [Retd] Muhammad Rafique, were admitted in tehsil headquarters hospital in Nikayal where their condition is stated to be out of danger, the district police chief said. 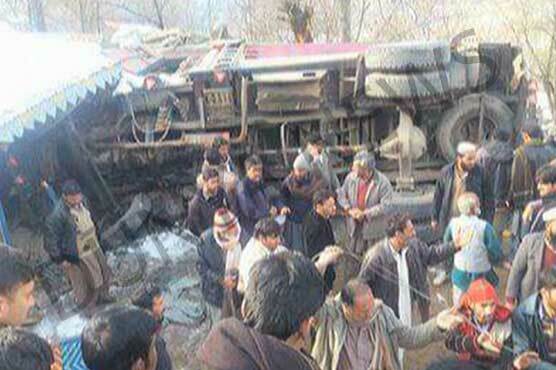 AJK Prime Minister Raja Farooq Haider Khan has expressed a deep sense of shock and grief over the loss of precious lives in the tragic mishap. In a condolence message, the Prime Minister prayed for the rest of the departed soul in eternal peace and grant of fortitude to the bereaved families to bear the loss with courage.